Step out of the city life by going to El Questro Wilderness Park and Emma Gorge. Spend the 4th (Tue) exploring nature at Mirima National Park. Spend the 6th (Thu) exploring nature at Mitchell River National Park. Next up on the itinerary: explore the activities along Ord River, explore the galleries of Artopia Kununurra, look for all kinds of wild species at Kangaroo Haven, and take some stellar pictures from Kelly's Knob Lookout. To see other places to visit, more things to do, photos, and tourist information, read our Kununurra trip planner. Sydney to Kununurra is an approximately 11-hour flight. You can also drive; or do a combination of train and bus. Due to the time zone difference, you'll gain 2 hours traveling from Sydney to Kununurra. When traveling from Sydney in June, plan for warmer days in Kununurra, with highs around 36°C, while nights are somewhat warmer with lows around 17°C. Finish your sightseeing early on the 8th (Sat) to allow enough time to drive to Wyndham. Wyndham is the oldest and northernmost town in the Kimberley region of Western Australia, located on the Great Northern Highway, 2210km northeast of Perth. On the 9th (Sun), explore the striking landscape at The Grotto, identify plant and animal life at Marlgu Billabong, then make a trip to Five Rivers Lookout, and finally pause for some photo ops at Warriu Park Dreamtime Statues. On the next day, get to know the resident critters at Zoological Gardens and Crocodile Park, don't miss a visit to Wyndham Port and Jetty, and then identify plant and animal life at Ord River Nature Reserve. To find ratings, other places to visit, maps, and more tourist information, you can read our Wyndham trip app . Getting from Kununurra to Wyndham by car takes about 1.5 hours. In June, plan for daily highs up to 36°C, and evening lows to 17°C. Finish up your sightseeing early on the 10th (Mon) so you can travel to Purnululu National Park. Start off your visit on the 11th (Tue): explore the wealth of natural beauty at Purnululu National Park. Get ready for a full day of sightseeing on the 12th (Wed): explore the striking landscape at Bungle Bungle Range and then take in the dramatic natural features at Bungle Bungles Range. To see photos, more things to do, ratings, and tourist information, you can read our Purnululu National Park travel planner. You can drive from Wyndham to Purnululu National Park in 6.5 hours. Finish up your sightseeing early on the 12th (Wed) so you can travel to Talbot Bay. On the 13th (Thu), admire the sheer force of Horizontal Falls. To see other places to visit, where to stay, reviews, and other tourist information, you can read our Talbot Bay holiday planner . Explore your travel options from Purnululu National Park to Talbot Bay with the Route module. Wrap up your sightseeing by early afternoon on the 13th (Thu) to allow enough time to travel to Derby. Derby is a town in the Kimberley region of Western Australia. Get in touch with nature at Manning Gorge and Mount Barnett. 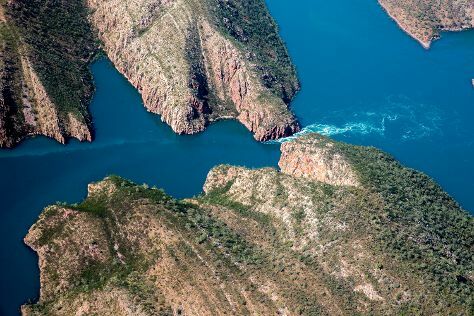 Next up on the itinerary: admire the masterpieces at Norval Gallery, don't miss a visit to Boab Prison Tree, take a leisurely stroll along Derby Jetty & Wharf, and enjoy the scholastic atmosphere at Kimberley School of the Air. For reviews, photos, and other tourist information, refer to the Derby itinerary planning app . Explore your travel options from Talbot Bay to Derby with the Route module. June in Derby sees daily highs of 36°C and lows of 19°C at night. Finish your sightseeing early on the 16th (Sun) to allow enough time to travel to Broome. Your inner history buff will appreciate Japanese Cemetery and Catholic Diocese of Broome. Get in touch with nature at Nature & Wildlife Tours and Gantheaume Point. And it doesn't end there: enjoy the sand and surf at Cable Beach, head outdoors with Staircase To The Moon, tour the pleasant surroundings at Reddell Beach, and look for all kinds of wild species at Malcolm Douglas Crocodile Park and Animal Refuge. Traveling by car from Derby to Broome takes 2.5 hours. In June, daytime highs in Broome are 35°C, while nighttime lows are 19°C. Wrap up your sightseeing by early afternoon on the 22nd (Sat) to allow time for travel back home.